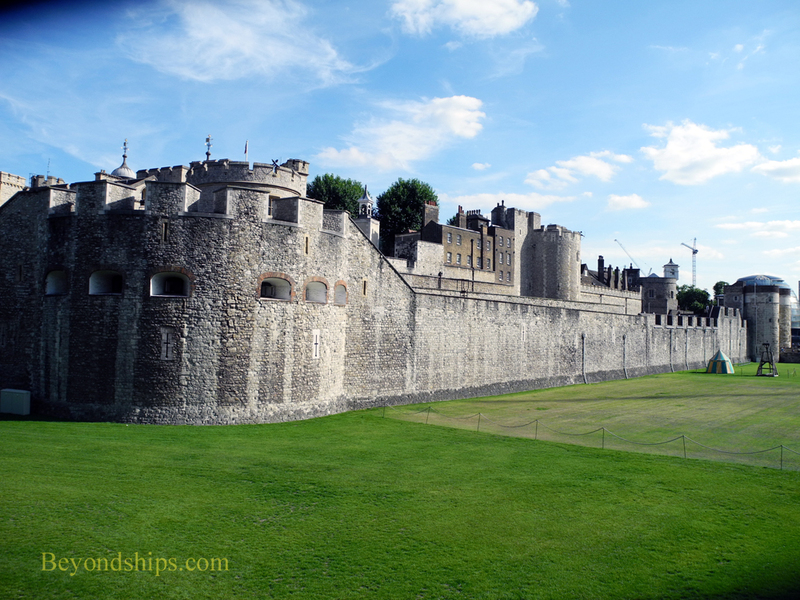 The Tower of London is not a single building. Rather, it is a series of buildings built over the centuries, which are enclosed by a defensive wall. It is essentially a castle. Once inside the Tower, where to go and what to see can be somewhat daunting. This is a sizable complex covering some 13 acres. Looked at from above, the Tower is a series of concentric rectangles. The center is the White Tower, which can be considered the castle keep. Then there is a curtain wall enclosing the interior grounds. Surrounding that is yet another curtain wall with towers constructed by King Edward I. Outside of that there is the Thames on one side and a moat on the other three. The moat is dry now but in medieval times it was flooded and a reputation for filth. 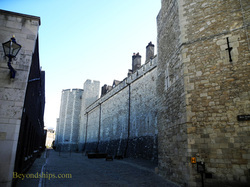 A good way to become orientated is to take one of the guided tours given by the Yeomen Warders - - the people dressed in the Tudor-style uniforms. These tours leave every half hour from near the main entrance and are included in the price of admission. They provide insights into the Tower and its history. Often the Yeomen Warders can be quite witty as well. Alternatively, the Tower sells both audio and printed visitor guides. Although kings and queens have lived here in the past and even though there are still accommodations here for use by members of the royal family (not open to the public), there is no lavish palace here. The rooms that you will see are rather spartan, reflecting the Tower's primary roles as a fortress and a prison. Above: The flat area surrounding the outer wall of the castle was once a moat filled with water. Above: The main entrance is through Middle Tower. Visitors then go cross a bridge spanning the moat and through the outer defensive wall. 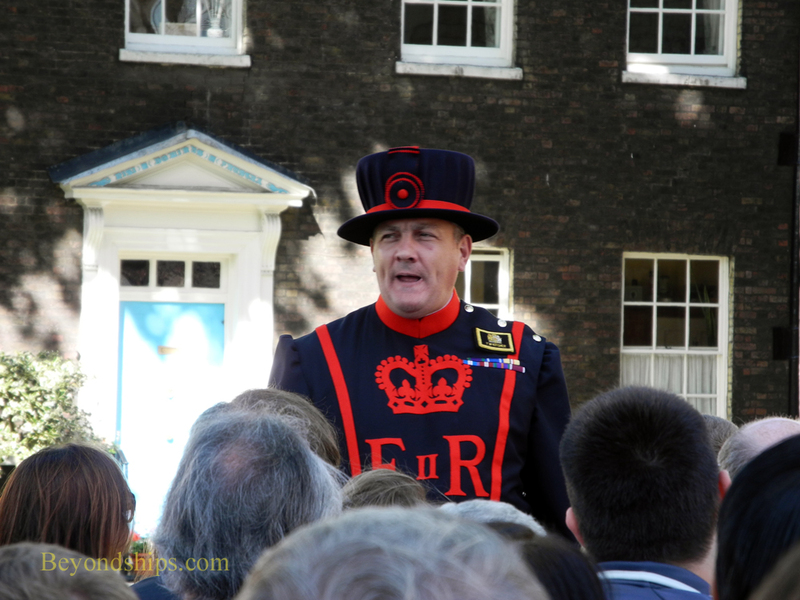 Below: A Yeoman Warder leading a tour. Above: The Crown Jewels are housed in Waterloo Barracks. The cornerstone of this building was laid by the Duke of Wellington in 1845. 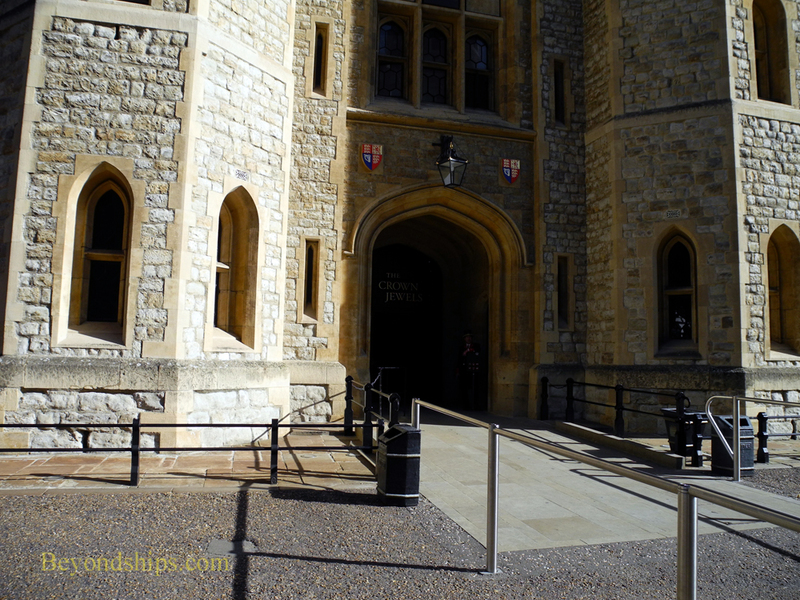 Below: The entrance to the Crown Jewels exhibit. There is no additional charge for viewing this part of the Tower. However, there are often long lines. 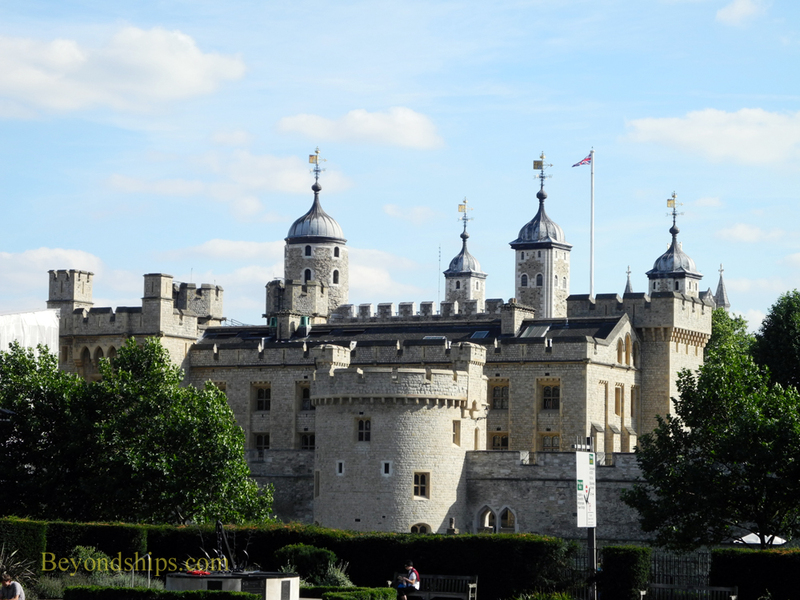 The Tower has been the repository for Britain's Crown Jewels for centuries. These include the crowns and other regalia used by members of the royal family during coronations and other state functions such as the annual opening of the Houses of Parliament. Included here are some of the largest and most valuable gems in the world. Most of the crown jewels date from the Restoration of the Monarchy in 1661. After the victory of Parliament in the English Civil War, the monarchy was abolished and the ancient crown jewels broken up. Therefore, at the end of the Commonwealth when King Charles II was invited to return, new crowns and regalia had to be created. Since then, many new pieces have been made, often recycling jewels that had been used previously. You can no longer go into the Jewel House and handle the jewels. That ended in 1815 after a visitor broke the State Crown. Now they are displayed behind thick glass. The displays are nicely lit and present the various objects so that visitors can get a good look at them. A mechanical people-mover runs along the side of the display holding the most important objects thus keeping the flow of visitors moving. In addition to the jewels themselves, there are video displays showing how some of the items are used. 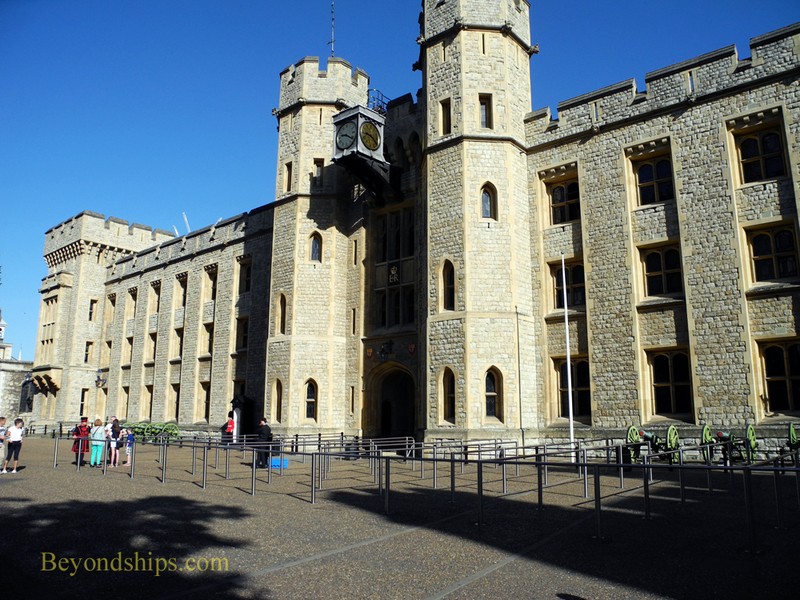 The Crown Jewels are the most popular attraction in the Tower. As a result, there are often long lines to view them. The only way to avoid these lines is to arrive early, just as the Tower is opening to the public for the day and to go immediately to the Crown Jewels. 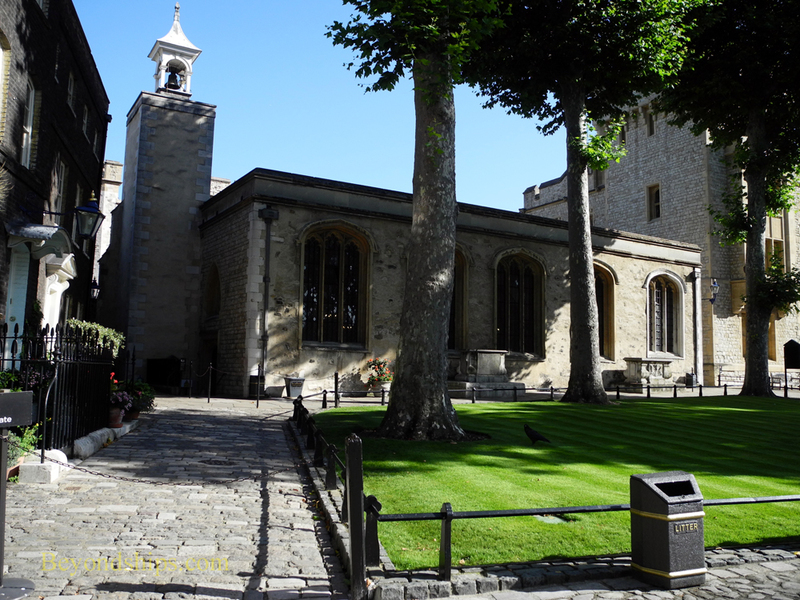 The Chapel Royal of St. Peter ad Vincula dates from the time of Henry VIII. However, there has been a chapel here at least since Norman times. It remains the parish church for the 150 people who live in the precincts of the Tower. In addition to being a place of worship, the chapel is a burial site. 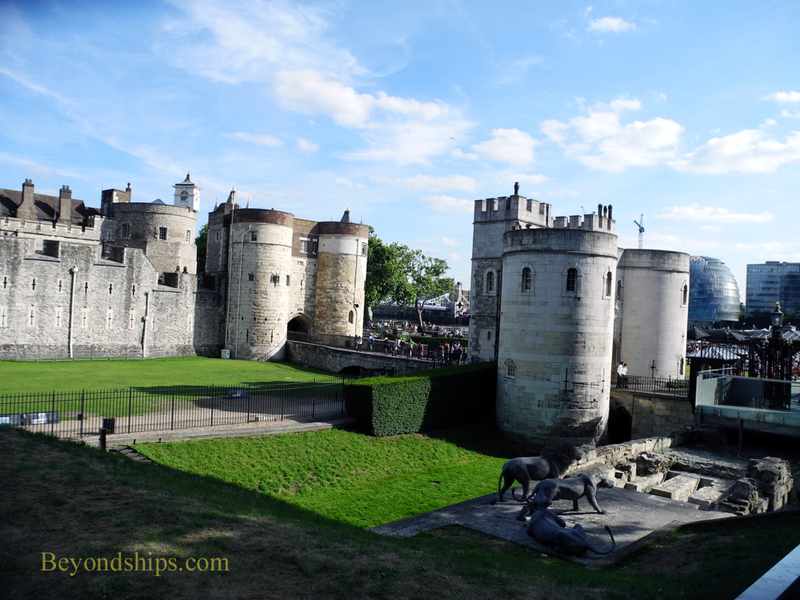 It contains the remains of three queens of England – Anne Boleyn, Catherine Howard and Lady Jane Grey - - and of two saints - - Sir Thomas More and John Fisher. Sadly, the common thread here is that all of these people were executed nearby. There are 60 people buried here, but only nine with their heads on. The Chapel is open to the public during the last hour of the day. 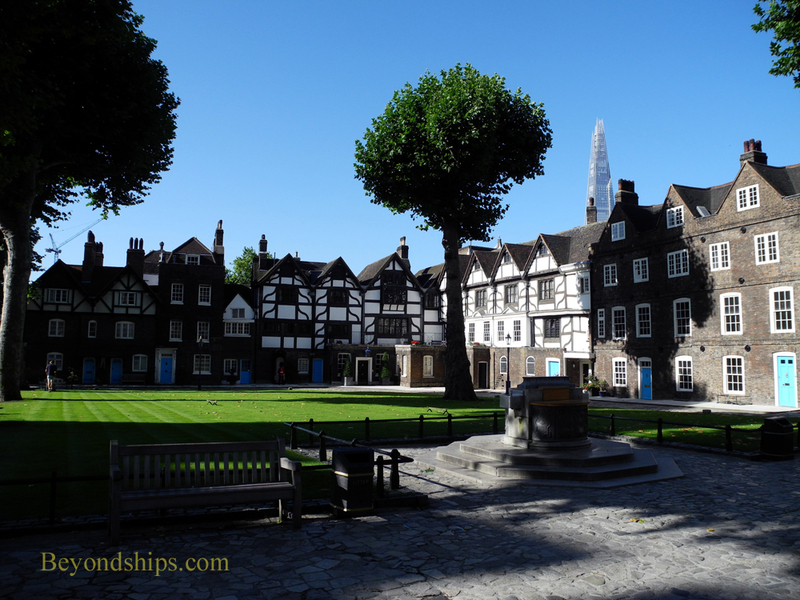 At other times, it can be seen on the Yeoman Warder tours. On the west side of the Tower grounds is a peaceful green shaded by tall trees. Its history, however, has been far from peaceful. This was a site of execution. Most prisoners were executed outside of the walls of the Tower where crowds would assemble for entertainment, jeering and insulting the condemned prisoner. High ranking nobles, however, had the privilege of being executed inside of the Tower. 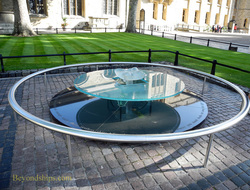 A memorial now marks the spot where it is believed that Queen Anne Boleyn and others were decapitated.